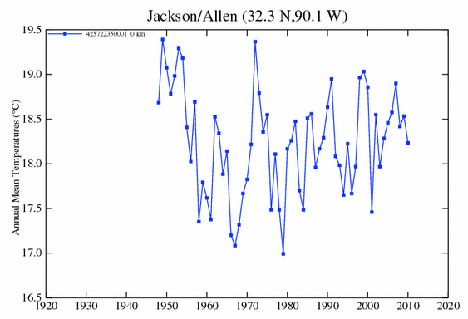 There are 32 USHCN stations in Mississippi, from Aberdeen to Yazoo City, and there are two GISS stations on the list for the state, one at Meridian and one in Jackson..
On the other hand the station in Jackson has only been recording data since 1948, and is another one of the truncated stations that seem so common in the list. 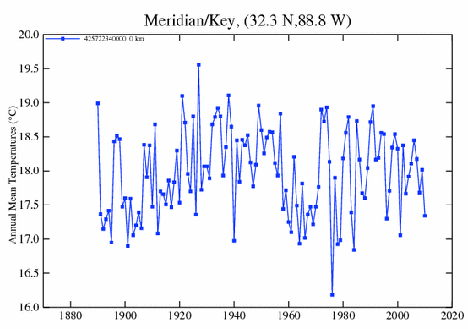 As with Meridian, the recent temperatures do not appear to have been the highest within the station’s history. There was just a little confusion as to where the two University locations cited were located, and, after checking the locations with Google Earth it turns out that State University is at Starkville, while University is at Oxford. 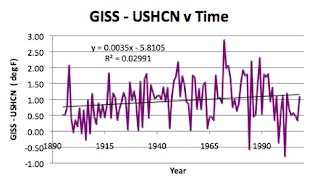 There is a difference between the GISS average and that of the USHCN sites., with the average being a 0.96 deg F increase in going to the GISS data. 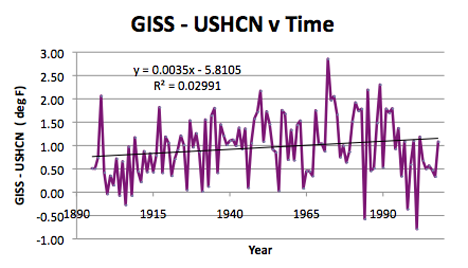 The USHCN homogenized data does show that the temperature in the state has increased over the past 115 years, but only at the rate of 0.12 deg F per century. 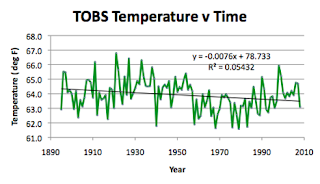 When one looks at the TOBS data, the raw data shows that the temperature in the state has fallen in that time frame, at a rate of about 0.76 deg F per century. 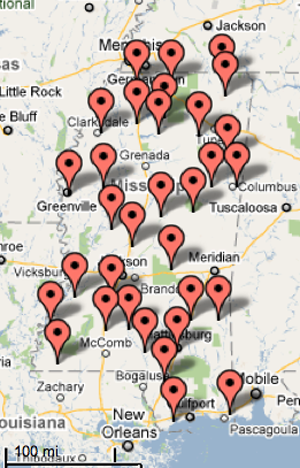 Mississippi has only a short coastal exposure to the Gulf of Mexico. It is 340 miles long and 170 miles wide. It runs from roughly 88 dg W to 91.67 deg W, and from 30. 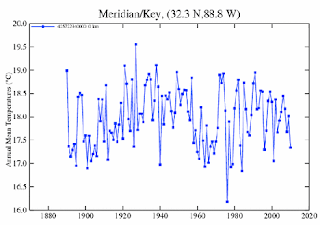 22 deg N to 35 deg N. The center of the state has a latitude of 32.715 deg N, while the USHCN is at 32.8 deg N, and that of the GISS stations is at 32.32 deg N. The state has a mean elevation of 91.4 m, ranging from seal-level to 245.6 m above sea level. The USHCN network has an average elevation of 85.9 m, while the GISS pair average 96.6 m.
Looking at how the geography affects the temperature averages for the state, using the TOBS data, I start with the effect of changing latitude. 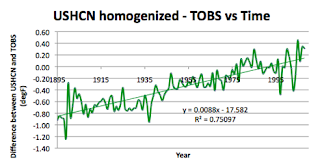 I use the TOBS data because it has not been manipulated as the homogenized data from the USHCN have been. The problem with the homogenized data is that it does a certain amount of averaging that can lower the correlation with geographic factors. 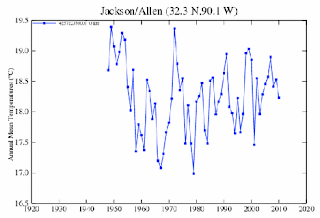 And this can be illustrated, for example, by comparing the above figure, which uses the Time of Observation corrected raw data, with the plot using the homogenized values. 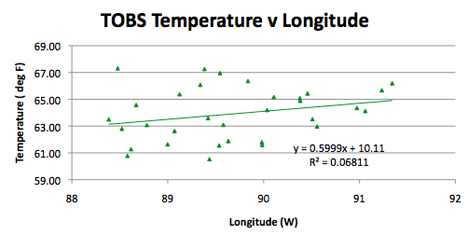 The correlation coefficient, which is 0.92 with the TOBS data, falls to 0.78 with the homogenized values for temperature. The land falls, on average, as one moves west, and so the temperature rises. 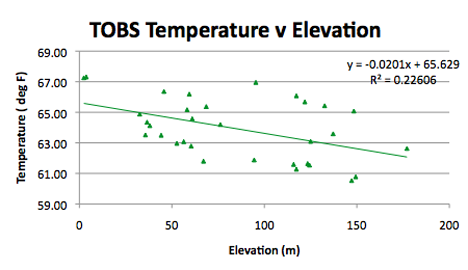 As I have mentioned before I believe, and this change in correlation supports it, that the correlation is an artifact based on changes in elevation. 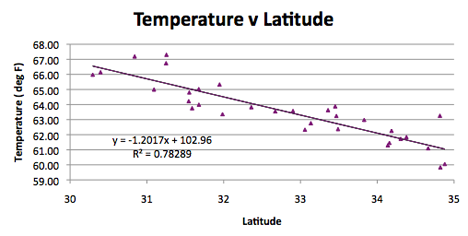 The regression coefficient changes from 0.226 to 0.113 when the data is homogenized. Looking at the effects of population, the trend is in the opposite direction to that in many states, falling as the cities grow in size. 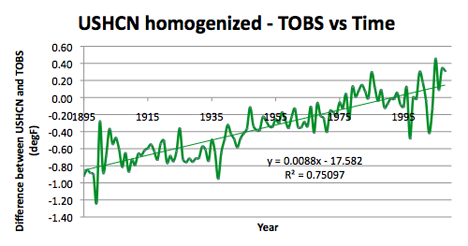 Which leaves only the comparison between the homogenized data and the TOBS temperatures, over the century. 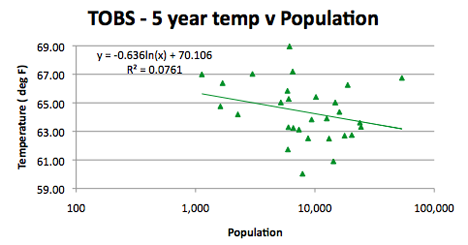 Interesting point about MS location temp vs population having the opposite trend to other States. Sometimes an anomaly can be the key to unlocking a puzzle & upending a "concensus" hypothesis (e.g., the motions of Mercury being inconsistent with Newton's Laws). 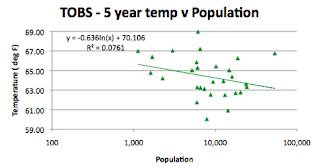 So why don't MS cities fit the pattern of other States -- a pattern which would seem to fit with the Urban Heat Island distortion which may explain a large part of "Anthropogenic Global Warming"? 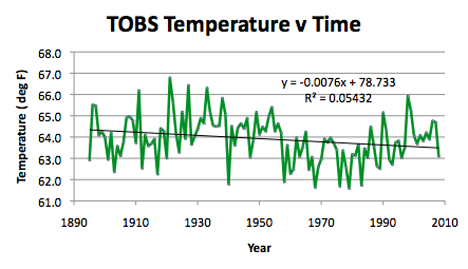 Or is the situation that the scatter in the data is so large (R2 only 0.08) that the trend is meaningless? 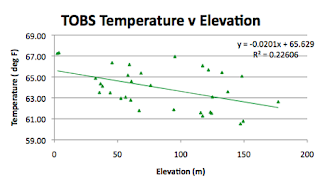 At some stage in the future I am going to integrate the variations due to elevation, latitude and population into a multi-variate analysis. But while the intention is there, time is still proving hard to find to git 'er done! IBut that was one of the reasons for talking a bit about Crossville when I wrote about Tennessee temperatures last week.